Ph.D. in EEE is a 3-year Doctoral level program in Electronic Engineering. The course comprises of in-depth research work and is subjective in nature, wherein the students are required to submit their research thesis at the end of the program to be rewarded the doctorate title. Holding an M.Phil. degree in Electronics or qualifying an M.E. or M.Tech. degree with minimum aggregate of 60% marks and above is a prerequisite for the program. The course fee ranges between INR 23,900 to 2.37 Lacs, which is subject to differ for different colleges and institutions. Qualifying the GATE entrance test is necessary criteria for availing for the program. In case of those who have earned an M.Phil. the criteria of entrance examination are not applicable to them. After selecting candidates who have cleared the entrance test, they would be further notified for the personal interview and group discussion by the college and universities. Admissions would be processed calculating the marks secured in the overall screening process. The program lays grounds for candidates to conduct research on the chosen field in order to earn the Doctorate degree. Candidates are required to possess the knack of getting into the details of the subject and conducting an in-depth research. They should have the ability to analyze, design and evaluate data and suggest possible solutions to the problem. Having good interpersonal skills, the ability to work in a team and having mature leadership personality are traits which are deemed suitable for undertaking the program. They should also possess good knowledge of electronics and other aspects related to the field. Doctorates can thereby avail for employment in fields of academics as professors in reputed colleges and institutions, research and development, IT sector, Power Sector and so on. The average remuneration earned by candidates ranges between INR 2 to 17 Lacs per annum. Eligibility Qualifying M.E. or M.Tech degree in Electrical Engineering with an aggregate of 60% marks and above or equivalent GPA or Qualifying M.Phil. Degree/ Entrance Examination of GATE, NET, etc. Job Positions Power Electronics Engineer, Power Manager, Product Development Engineer, Systems Engineer, etc. Ph.D. in EEE: What is it About? Ph.D. in EEE course integrates the study of electrical field combining it with an in-depth research work. Students are introduced to the workings of electricity, electromagnetism, and electronics. The course is covered in a duration of 3 years and may sometimes span for more years ranging up to 5 years. Students after gaining a deeper perspective of the subject are made eligible to conduct research work and thereby generate thesis on their topic of interest. The program aids in polishing the skills of candidates in making them proficient with their communication and interpersonal skills. This is noted to be a beneficial course from the aspects of gaining promotions to higher positions on the work front. The course is extremely subjective wherein each and every aspect of the study is covered with detailing, making this a career-oriented program. Students through the curriculum design are able to keep themselves abreast with the latest changes and innovations happening in the field, which would further help in the smooth conduction of thesis and research. Ph.D. in EEE curriculum is a balance between theory and practical work. The initial years of the program concentrate on imbibing students with the classroom study of the subject. They are provided with the knowledge and training relevant to contemporary aspects of social and economic objectives of the country. The final year of the program requires candidates to prepare a research thesis under the guidance of experts, only after which will they be rewarded the Doctorate title. Ph.D. in EEE makes the student competent to conduct research on varied topics, generate a report and present the data in a graphical form. Having gained an expanded knowledge of the subject, the students have lucrative opportunities in the fields of Telecommunications, Research and Development, Power Sector, IT and much more wherein they can hold higher positions. The course aims at making the students competent and proficient in the field by instilling in them the skills and tools to conduct research. Candidates those who have completed their M.E. or M.Tech degree in Electrical Engineering with an aggregate of 60% marks and above or equivalent GPA are eligible for admission. Qualifying the GATE entrance examination held for Ph.D. programs is a prerequisite for the program. Those who have already qualified their M.Phil. degree and have attended entrance examination can gain direct admission to the program and will not be required to clear any entrance examination. Certain colleges may conduct their own entrance examination for the program, which would be followed by Group Discussion and Personal Interview. Aspirants are required to fulfill the eligibility criteria as set by different colleges for admission. A valid GATE percentage is compulsory for those seeking admission to the program. In addition to qualifying the M.E. or M.Tech. degree in Electrical Engineering is a prerequisite with a minimum aggregate of 60% marks and above. For those who have already completed their M.Phil. degree are exempted from attending any entrance examination. The degree will be considered equivalent to doctorate and students can gain direct entry to the course. Admissions will be based on merit list marks which would be calculated on the combined score received after qualifying the screening process. The shortlisted candidates for various entrance examination held at state and national level will be notified for attending the further sessions of group discussion and personal interview. Computing the overall marks the admission of candidates will be further processed. Applications for the program can be downloaded from the official website of the college or collected from the institution. The curriculum of Ph.D. in EEE is a subjective one which includes an in-depth study of various aspects of the field. This is followed by a detailed research work under the guidance of experts in the preferred field of study. The initial years of the program would comprise of theory and practical training into the subject along with seminars, projects, and fieldwork. Ph.D. in EEE qualifies students in handling diverse fields of work in the field. They gain major insight in handling research problems, analyzing and evaluating the data by applying their skills and knowledge. With expansion in their knowledge and enhancement of skills, opens up a wide field of opportunities for candidates on the career front. After the completion of the program, candidates have the opportunity to begin their career in academics as professors or explore their skills in the areas of IT, Power, research and development, Transport and so on. 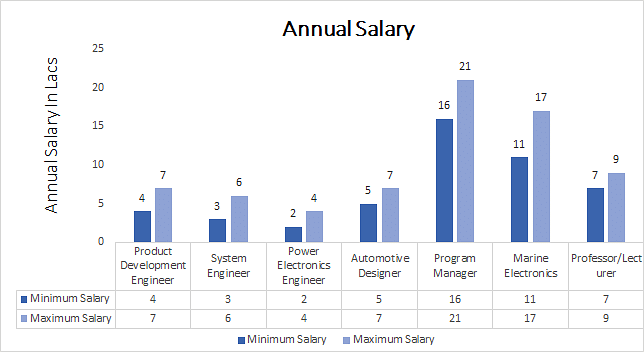 They can become Power Electronics Engineer, Program Manager, Product Development Manager, Systems Engineer and so on.